Cardamom is not commonly used in Thai cuisine except for massaman curry; however, it's widely used in Thailand for medicinal purposes such as treatment of stomach-aches, constipation and other digestion problems. This exotic spice is commonly used in Danish pastries, Scandinavian spice cakes and our recipe for cardamom waffles, Saudi Arabian coffee, North African and Indian cooking and in spice blends such as garam masala, curry powder, and berbere. Cardamom is a dried, unripened fruit from a perenial plant. Enclosed in the fruit pods are small brown, aromatic seeds. Cardamom can also be spelt cardamon, and in India it is popularly known as elaichi. We have excellent quality cardamom to offer at a very reasonable price, packed by premium Hand Brand, imported direct from Thailand. Cardamom is an earthy, fragrant spice grown in Thailand, a relative of the ginger family that tastes a bit like a cross between anise and almond. 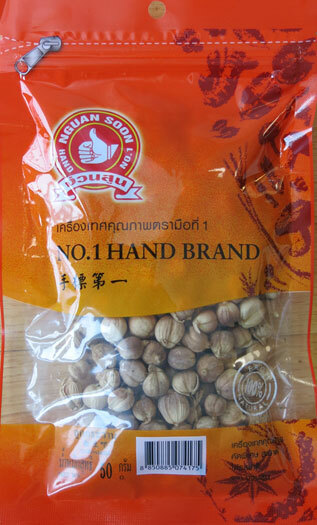 It's part of our Thai spice kit. Cardamom is often used in Scandinavian cooking. Waffles are found throughout Thailand especially in department stores, where you can find small waffle kiosks. Here is a European-style waffle recipe using cardamom that we know you'll enjoy.